Team hopeful of much-improved 2019 with new-look car; Claire Williams says Kubica and Russell represent "next-gen Williams"
Williams have unveiled a revised look for 2019 with the sport's one-time dominant team eyeing a dramatic renaissance in fortunes this year. 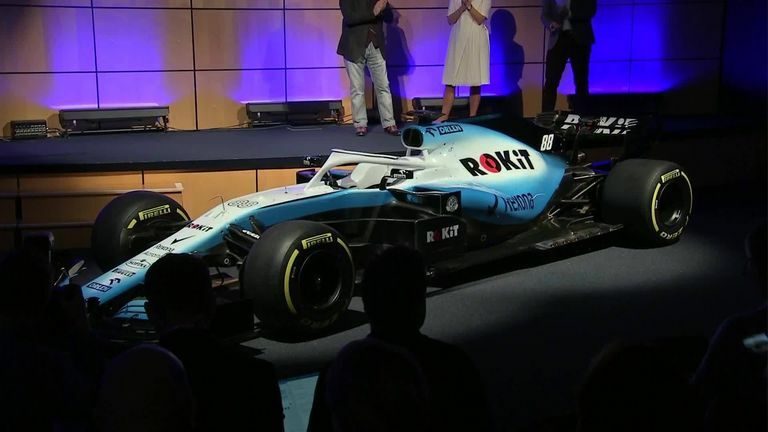 While Williams' actual 2019 car, the FW42, is being kept under wraps until the opening day of winter testing on February 18, the reveal of this season's livery at their Grove factory effectively opens what they hope will be a new chapter for the team. "If he didn't like it he probably would have fired me!" quipped deputy team principal Claire Williams when asked what her team-owning father, Sir Frank Williams, thought of the break with livery tradition. The nine-time constructors' champions finished bottom of the standings for the first time in their illustrious history in 2018 with just seven points - a slump which has prompted widespread changes at the team. "Last year was very tough for us," said deputy team boss Claire Williams. "It's soul-destroying for any team to feel that way. "But we have lost pretty much nobody from our race team over the winter and I think that tells you the strength we have at Williams. "None of us want to go through what we went through in 2018. Our target has to be to make progress." Williams continued: "A team doesn't go from P5 to P10 without some area of weakness. We've done a lot of work, but it's a journey and a pathway. It won't be until Australia until we really see where we are. "Paddy Lowe [technical chief] has undertaken a huge amount of work to make sure we have the right people in the right jobs. I firmly believe we have great resources and we need to make sure we are using it in the right way." Can Kubica and Russell help reverse Williams' slide? In one of F1 2019's most exciting and intriguing match-ups, the returning Robert Kubica partners English youngster and F2 champion George Russell - the first Briton to drive for Williams full-time since Jenson Button during his own rookie year in 2000. Kubica, meanwhile, completes his astounding return to an F1 race seat eight years after sustaining severe hand and arm injuries in a rallying accident. The 34-year-old Pole served as the team's reserve driver in 2018. "They are going to be really exciting to watch," Williams exclaimed. "We have gone through a lot of transformation over the last few months. This is next-gen Williams. George and Robert are really the essence of next-gen Williams." Russell is only on a short leash from world champions Mercedes as a highly-rated product of their young driver academy, but the 20-year-old insisted: "It's not going to happen overnight, but I'm in this for the long haul. "My aim is to help build this team as well."